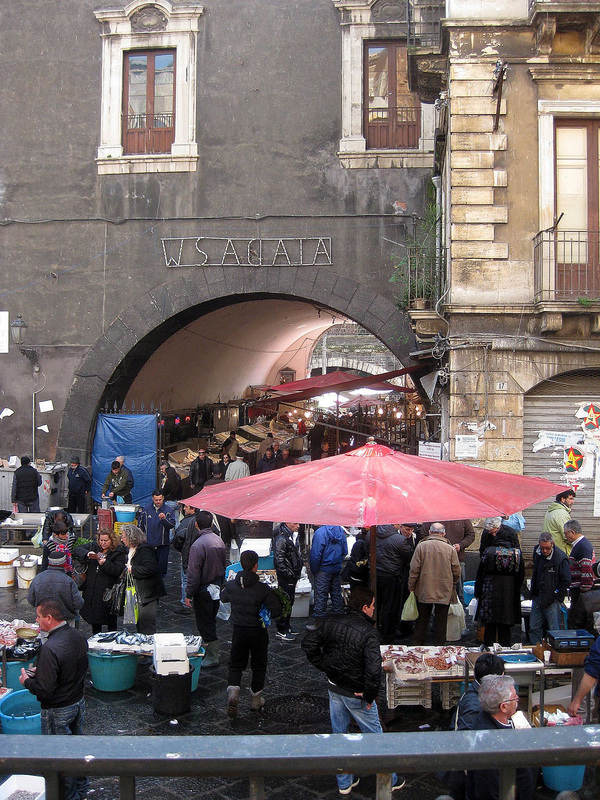 Siracusa, particularly Ortigia, would be a tough "act" for most cities to follow. 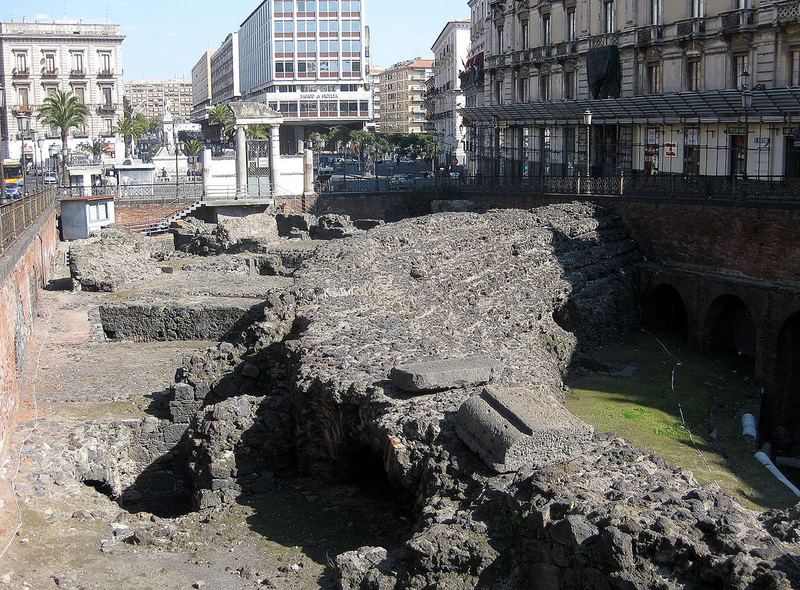 In this tale of two cities, Catania didn't really stand a chance. 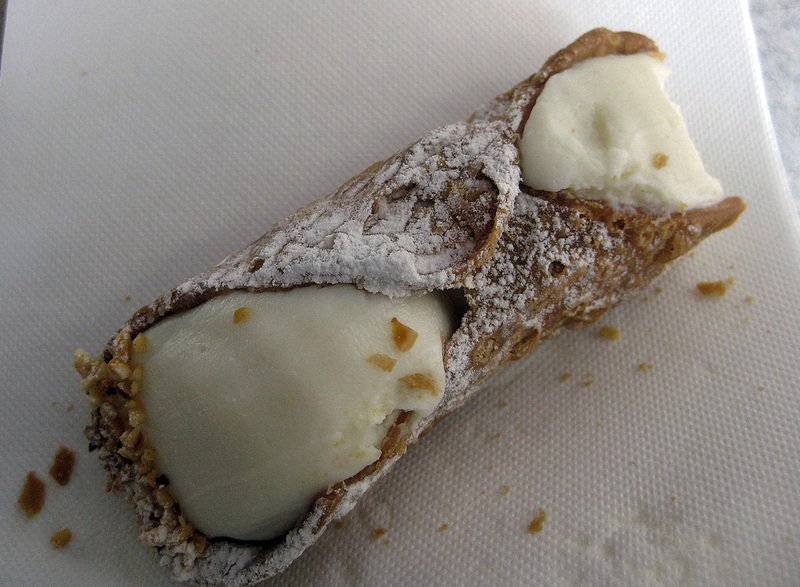 It's big, second in Sicily only to Palermo. It's industrial, and that shows clearly coming in via train as I did. And it's run down. Once grand buildings in the Baroque style are crumbling. 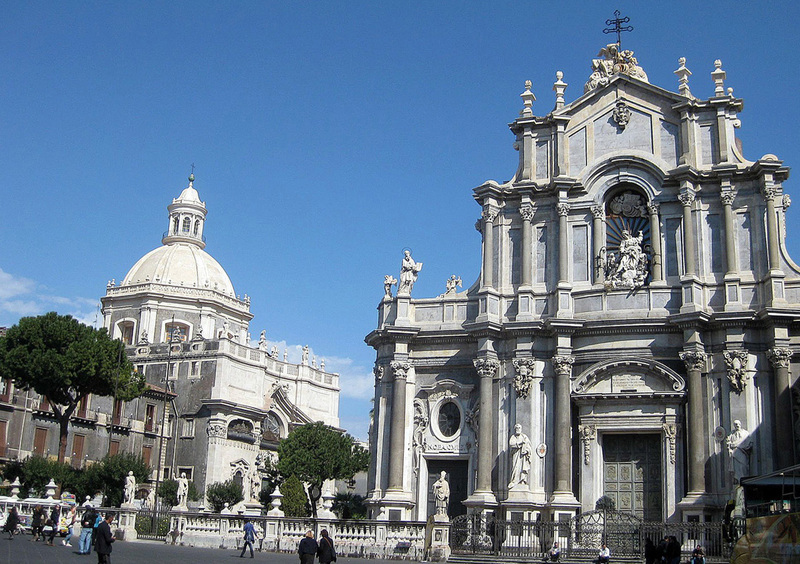 Catania took one of the worst hits from the earthquake of 1693, but was rebuilt in splendor. 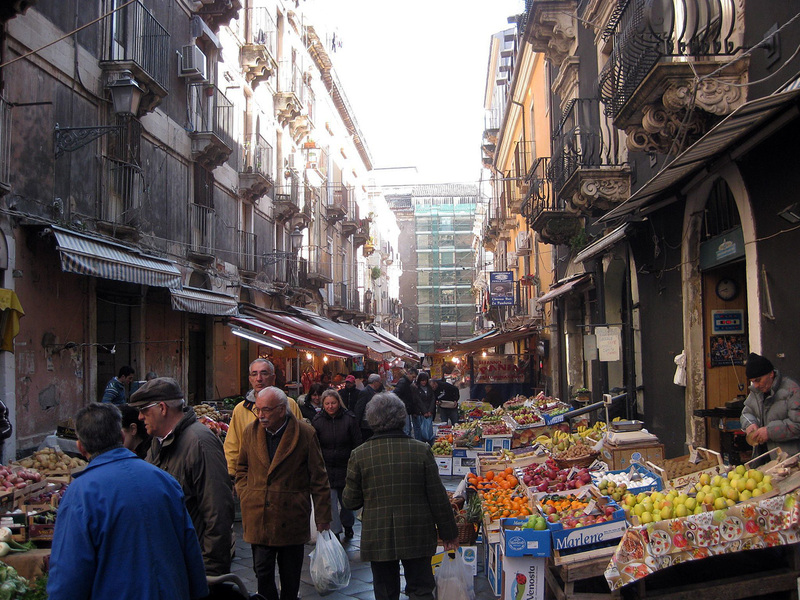 One of the things that Dottore Gianni found sad about the city is the decay. Once great buildings crumbling -- when a mediocre city crumbles it's not pretty, but when a city with lofty longings falls apart it is visually more evident, and to my mind doubly depressing. That's a pretty grim way to start, but my own trip crumbled somewhat when I arrived in Catania - as I wrote in my introductory post on Sicily -- it was the best of trips, it was the worst of trips. I'll amend again what I amended then -- hardly the worst! And I did find pleasures in this big, boisterous city. 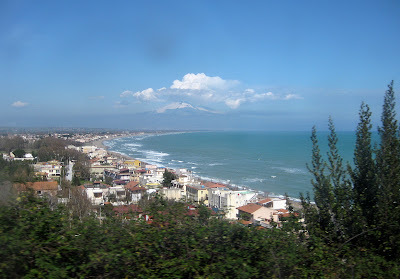 I also noted when I began to write on Sicily that my own planning fell apart. In a sort of sub-theme for this post, that we might call "Jack vs the Volcano," there was no reason I should not have seen Mount Etna, for example. I DID see it, from several different angles, on the train from Siracusa. It's quite a powerful presence, in that it dominates the landscape physically, but also in that one knows what's going on deep inside it, and that eruptions are always possible. 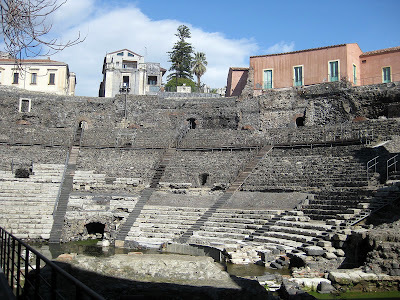 I convinced myself that I had seen enough from the train, I did not come prepared for the much cooler temperatures I'd have experienced heading to the peak, I hadn't given myself enough time in Catania to do the city justice, I also really wanted to make a day trip to Taormina, primarily to see the fantastically placed Teatro Greco there. But then I didn't do that either. Reading about the difficulty of getting from the rail station toTaormina itself daunted me. In fact I began to be daunted in general upon arrival. I tried to find my hotel, very near the rail station, on my own, and could not. A kind taxi driver at the station did not take me for a ride, literally or figuratively, instead pointed in a direction I'd not thought to search, said "Azzuro?" (which means blue). I saw the building he pointed to immediately, only a very short walk away. Then he said, "Rigel." (the name of my hotel. I thanked him profusely and headed toward it. On the way I was accosted by several rather frightening men aggressively offering to carry my bag, to drive me where I wanted to go, to feed me, to sell me things -- god knows what else! And I had to push my way past them to get away from the station and across the few streets that separated me from my destination. And as I had walked the area searching for the hotel I saw just how run-down it was. I remembered the reviews of the hotel I'd read: "Great hotel, lousy area." They were right! When I arrived at the hotel at about 12:30 pm I was warmly greeted and immediately shown to a very nice room. In fact, such was my state that I thought, "Well, I can always stay in the room!" The receptionist spoke almost no English, but when I asked for it gave me a good map of the city, and when I came back down helped me by signs and gestures in my search for the center, about 15 minutes away on foot. So you see I didn't just stay in the room. I plunged into a city that grew more interesting to me as I walked. Probably the most important area is the Piazza Duomo, and it was the first place I came upon. Not one, but two enormous churches dominate that square; obviously the Duomo itself but just across the street from it Sant'Agata, named for the patron saint of the city and martyr. The story goes that after attempting to evade the unwelcome advances of the Roman in charge of the city, she was whipped, mutilated and burned. Another cheerful tale of martyrdom! Apparently her church is in a sad state of disrepair today, and is seldom opened, though in early February every year she is celebrated in a three day feast, and relics from the church are marched around the city in grand processions. The Duomo had closed after its morning hours and would not re-open until 4:30 pm, so I had to be content until the next day to see its facade, which is pretty impressive. Its history is as well, for while little of its medieval original structure (it was begun in the eleventh century) survived the earthquake of 1693, the Duomo was rebuilt in the Baroque style, using stones lifted from the ancient Roman amphitheatre only a few blocks away. 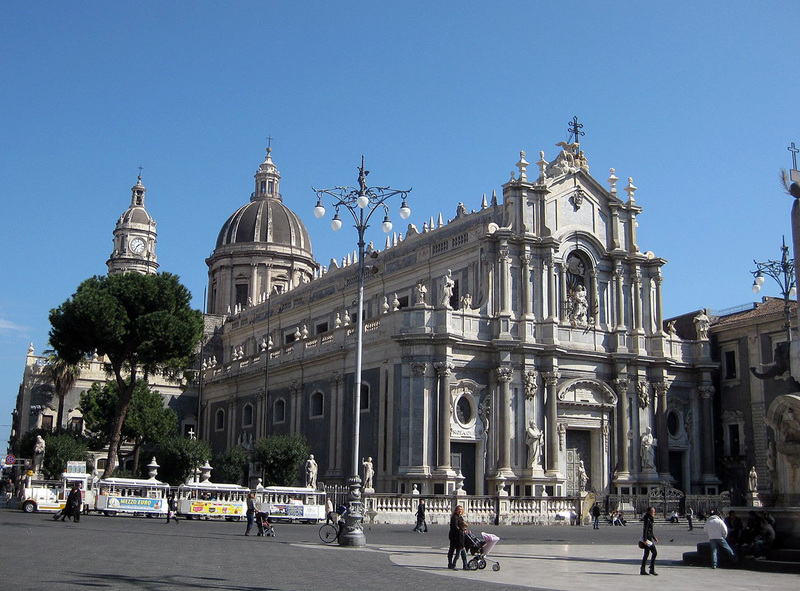 It also houses the tombs of three Aragonian monarchs and that of the opera composer Bellini, who is one of Catania's very favorite sons. 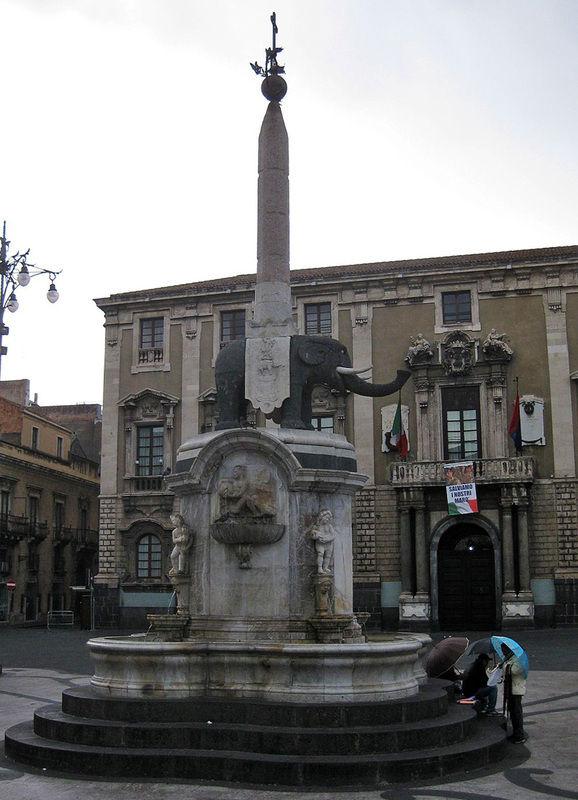 In the center of the square there is a fountain with statue of an elephant made from lava, the symbol of the city since the thirteenth century, depicting its triumph over the ever present threat of the volcano. Opposite the Duomo there are a few nice outdoor cafes. It's a pleasant urban space, and the beginning of a more-or-less pedestrian zone. I had to dodge cars and buses while walking through it, but I'm sure they mean well by the appellation. To the right of the Duomo is a seventeenth century grand gateway called the Porta Uzeda which leads out of the square and towards the gardens of the Villa Pacini beyond. 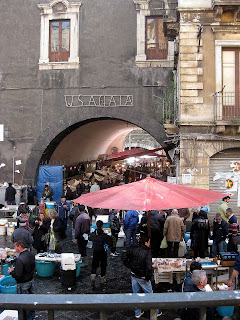 It's also one way to get to the famed market, the Pescheria, but that was closed on Sundays. I continued walking the pedestrian zone (carefully). It was a beautiful Sunday afternoon, though relatively few people seemed to be out and about in it.I walked north, on the largest and longest road in the city, the Via Etnea, which leads to, you guessed it, the very foothills of the great volcano. The first major square one comes to on this route is the Piazza dell'Universita, with two grand buildings dominating either side of it. 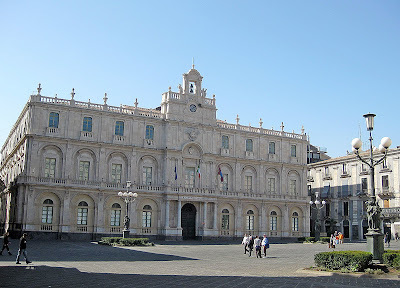 Catania is among other things a college town, and particularly around this square I felt a good deal of youthful energy, and hope for the place in the future as well. Shortly after that and off a few blocks to the right is the famous opera house named the Teatro Massimo Bellini. It's quite an ornate affair, and is set on two piazzas, one at its side, the other, longer and quite elegant leading directly to its front. 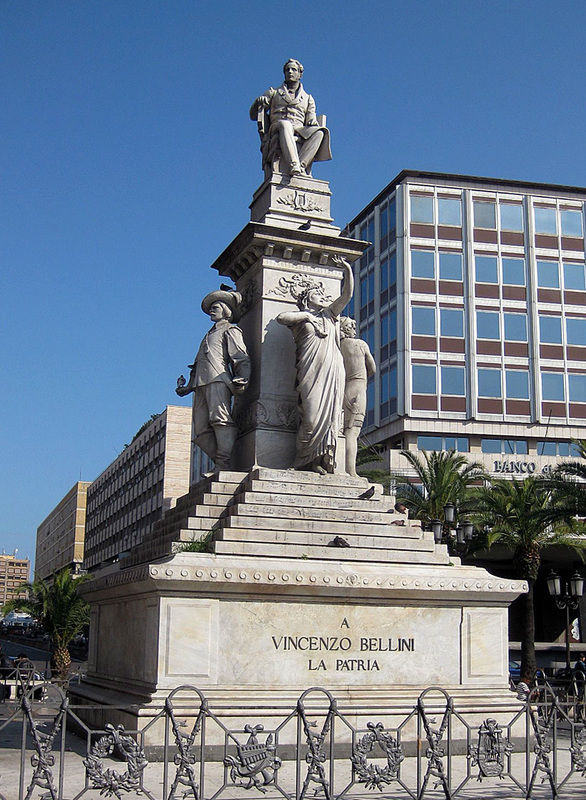 Of course it's named for Catania's most famous composer. Vincenzo Bellini, who wrote in the bel canto style. His operas include Norma and La Somnambula, and they are frequently performed here. 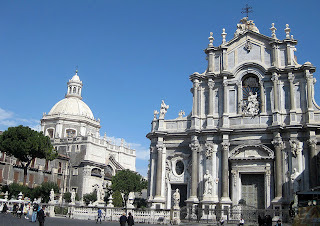 Sadly, nothing was on during my two nights in Catania, so saw only the impressive and ornate exterior. and on one side the remains of the Roman amphitheatre, or at least of one small portion of it. After this square I had several choices, and made one that proved to be fine in the concept but less than grand in the carrying out. Continuing the theme of "Jack vs the Volcano" I decided that should walk the length of Via Etnea (it begins at the Piazza Duomo, so I'd made a start, get to the foothills of the volcano, and take some great photos. Except I had a less than perfect sense of just how long that walk would be. I have noted in several travel blogs that maps can be deceiving, usually in my favor, as I find areas more compact and easily got to than they seem when I first discover them on maps. The Via Etnea is a very straight thoroughfare, and the walker can glimps Etna frequently, so I walked toward it. And walked...and walked...I passed many places of some interest, including the Villa Bellini, a large public garden in the center of town, named again for the composer, but it was nearly an hour when I reached the Piazza Cavour, looked at the map, realized I was still not even halfway to the end of Via Etnea, and sighing inwardly (I HAD wanted to accomplish this) turned around and walked briskly back. By the time I got back to Piazza Duomo lunch had ended, and I had had nothing since breakfast except for a delicious but small clementine, so I was about to go in search of some kind of food when an open top tour bus materialized in the square. I leept aboard and spent an hour seeing much of what I'd already seen. 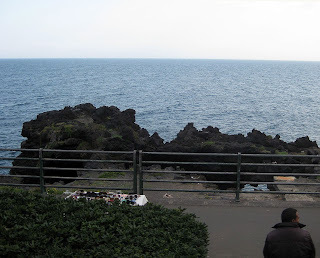 I had hoped to get a closer look at Etna from the bus, but the tour ignored it (why!?). 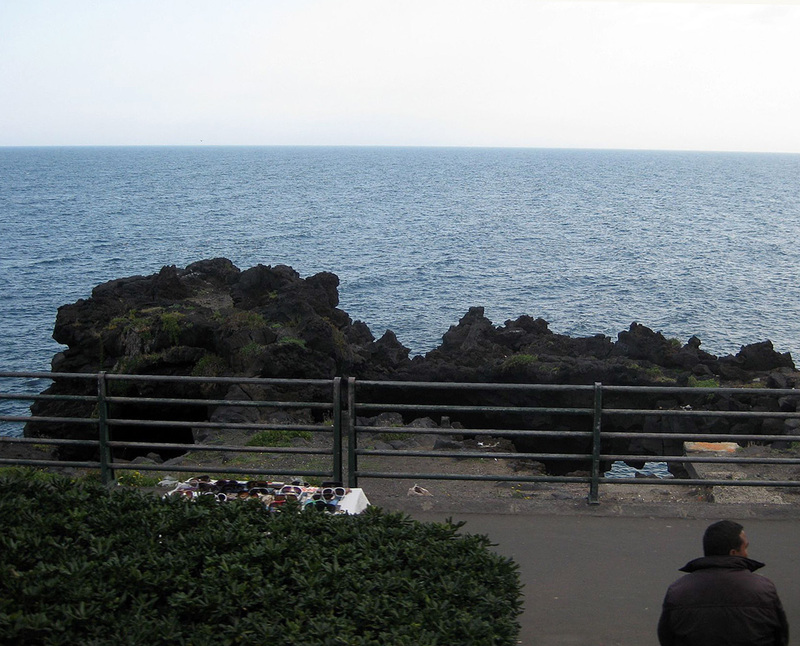 I DID see one area of interest that I'd not known about before, the coastline filled with black volcanic rocks. There are Homer's Odyssey connections in Sicily, and the area that would become Catania was, according to legend, the home of the Cyclops Polyphemus, who is outsmarted and then blinded by Odysseus, but who in a literal blind rage hurls boulders at the ship as it sails away. The legend goes that these large outcroppings of lava-based rocks are the stones that the enraged cyclops heaved at Odysseus's ship. Dottore Gianni likes that story very much! I had had nothing but great weather up to this point, and when I left the hotel the sky was so blue I didn't think for a minute of taking an umbrella or hat. In fact it was so warm that I wore a short-sleeved shirt. During the bus tour the weather worsened, clouded up, got a good bit colder, and it began to rain lightly. When we were returned to Piazza Duomo from the less than illuminating bus tour I found myself stuck, but several men, in fact a frightening amount of them, came to my and other tourists' rescue, running out into the square aggressively selling the ugliest, flimsiest umbrellas imaginable (echoes of my experience at the rail station). I bought one from the least aggressive fellow for 5 Euros - a wretched looking brolly of blue plaid. It only had to last me the walk back to the hotel and it did, barely. But in my haste to get out of the rain I had completely forgotten to eat, and around the hotel there were a few cafes open, but with only the most grotesque looking tiny pizzas to eat -- lots of gelato and outrageous sweetcakes, but nothing that would satisfy me. So I determined to fast, and successfully did so! At about 7 pm I thought I might go out in search of food, but it was dark, the area WAS spooky and I'd not seen anything resembling a proper restaurant in the neighborhood, so I decided I could wait until morning, and I did. The next day, my last in Sicily, was when I could have tried to get to Etna or Taormina, but instead gave up, or gave out, not certain which, and decided that I should give Catania another chance. 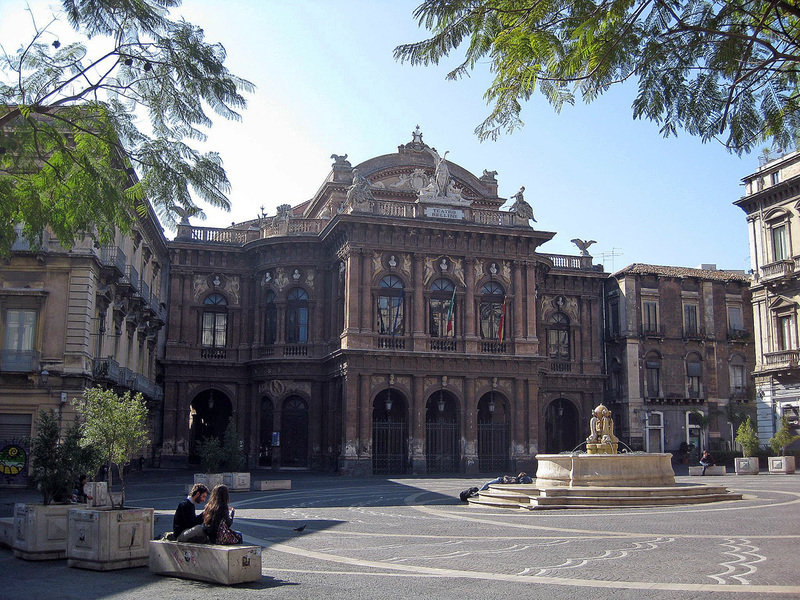 While I'm sorry that I missed both of the above places, and while I'm fairly certain that, much as I liked Siracusa I will not return to Sicily, I had a rather nice last day in Catania. I can be brief (believe me, dear readers, I can! ): first I took in the Duomo (nice, but nowhere near as interesting as the Duomo in Siracusa), then hit the Pescheria. The photos I have do not do it justice, but I had been warned to not look too touristy in that wild melee of fish, meat and veggy stands and sales people shouting at bickering customers, as it was pickpocket heaven, so I was maybe a bit too careful going through it. A confession: I do not think I could live well on even such a beautiful island, because I am not the type to throw myself in and fight for my dinner, haggling and insisting only on the perfect cut of swordfish or beef steak. These people seemed to revel in it, while I was exhausted just observing it. But it was something to see! 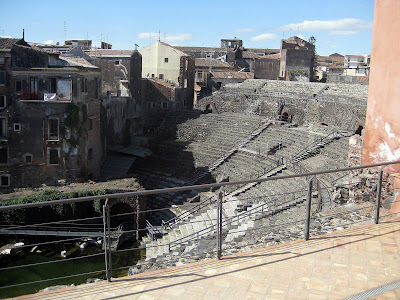 I spent most of my time that day at the Teatro Romano and Odeon. If you do not know about it you'd never find it, as it sits behind buildings on the Via Vittore Emmanuele, but once you find the entrance you're in for a treat - if you're a nerdy theatre historian like Dottore Gianni at any rate, having seen this hidden gem your day could have been considered at least a somewhat successful one. As soon as you've entered you see a fair sized and fairly well preserved theatre, completely surrounded by later buildings. It was discovered after the destruction caused by the great earthquake back in the late seventeenth century. The historians have done a wonderful job in the rooms off the theatre which explain its various parts, how it was found, and how preserved. After my "fast" the afternoon and evening of the day before, I decided that I would have a very substantial lunch as the main meal of the day, and have a sandwich of ham and cheese that I had made from the breakfast buffet for a light dinner. 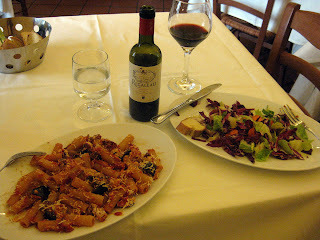 I spent a good bit of time looking for good restaurants and found one in Anticha Sicilia, very near the Piazza dell'Universita. Except for an insufferable headwaiter it was a great experience. I started with antipasto crudo, which I selected from a table full of yummy foods, then had a gigantic and delicious portion of Rigatoni alla Norma, and ended with a large insalata mista. For drinks I had ordered a small bottled water, and a half bottle of Sicilian red wine. I was too stuffed for dessert, but did have a nice espresso to end it all. And that ended my trip to Sicilia! 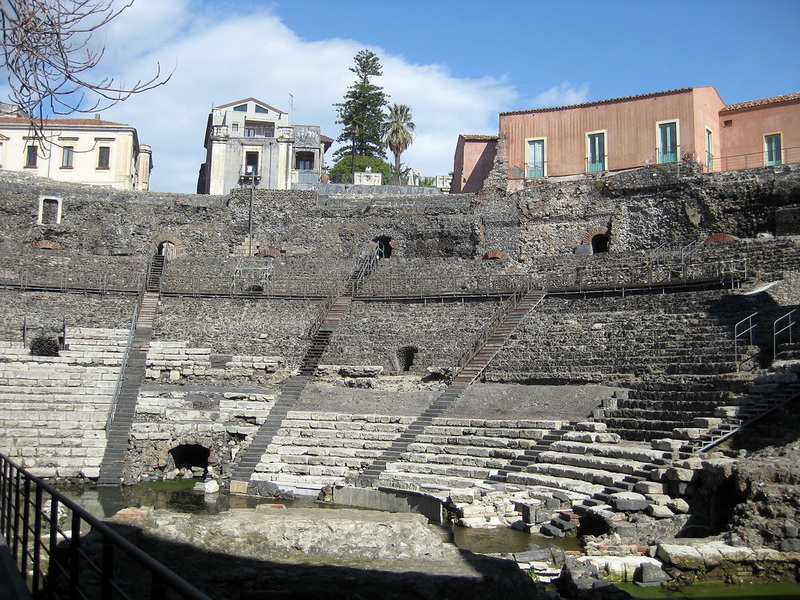 In the story of Jack vs the Volcano, Jack had clearly lost, and though I had wanted to see Taormina ever since I played Deeley in Harold Pinter's Old Times - there's a line in the play about it, and I loved saying it - first time I'd ever heard of the place - I obviously did not get there. Too bad, and not a perfect trip. But in this tale of two cities Siracusa, or Ortigia at least, had been wonderful, and Catania, despite some disappointments, was a nice surprise. I hope you've enjoyed reading about it!